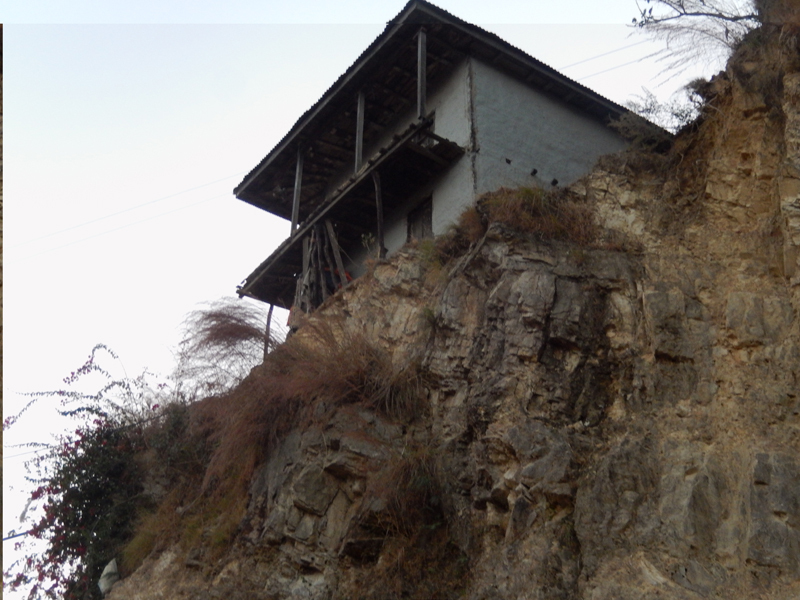 This photo provided by the office of the Kathmandu Tarai Expressway Project shows a house on Lendanda VDC of Makawanpur that is to be acquired by the project. KATHMANDU, March 16: Kathmandu Tarai Expressway Project has started the process of compensating owners of around 300 houses and sheds in Lalitpur and Makawanpur districts along the right of way on which the mega project will be built. Hetauda-based Building Technology Research and Training Center, a government agency under Department of Urban Development and Building, has already evaluated the price of about 150 houses and sheds and local bodies have already conducted public hearing to ascertain the rightful owners. The project office will soon start distributing compensation to the owners. The project has already paid compensation to most of the owners of land and house acquired for the project. It is still to acquire land on a six-kilometer stretch in Khokana district because of the dispute with locals over land valuation. The project has fixed 100-meter right of way for the 76-kilometer expressway. “Locals are happy with the valuation of their buildings and sheds. We will complete distribution of compensation very soon,” Ramesh Thapa, a surveyor for the project, told Republica. Of the 300 houses and sheds, 20 are in Lalitpur, two in Kathmandu and remaining in Makawanpur. Track-opening work of the project was completed by Nepal Army. The project spent Rs 840 million for track-opening work. The government has allocated Rs 10 billion for the project in the current fiscal year. The Ministry of Physical Infrastructure and Transport is preparing to set up a special purpose vehicle to execute the national pride project. Meanwhile, the project also has been clearing the track and doing some earthworks to facilitate movement of project vehicles. Upon completion, the expressway will reduce travel time to reach Bara by four hours to just around an hour. A committee led by Vice Chairman of National Planning Commission, Min Bahadur Shrestha, recently submitted its report to the Prime Minister, suggesting that the government execute the project by setting up a special purpose vehicle. It also has suggested to the government to negotiate with the Indian company, which prepared the project’s DPR, to acquire the DPR to execute the project at the earliest.